Deborah Ann Dingell was born in Detroit, Michigan on November 23, 1953. She earned a bachelor’s degree in Foreign Service in 1975, and a master’s degree in Liberal Studies in 1996—both from Georgetown University. 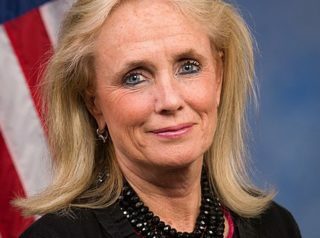 In addition to working for General Motors Corporation (GM) for over 30 years, Dingell served as president of the GM Foundation and as chairwoman of the American Automotive Policy Council’s Manufacturing Initiative. In 1999 Dingell and her husband, Democratic U.S. Congressman John Dingell, attended the second annual dinner of the Arab American Political Action Committee, an organization that seeks to help Arab Americans to pursue careers in government. In February 2014, Dingell’s 87-year-old husband—who had served in the House of Representatives since 1955—announced that he would be retiring from public life at the end of the year. That November, Mrs. Dingell won election to the House seat which her husband was vacating—that of Michigan’s 12th Congressional District. Soon after taking office, she became a member of the Congressional Progressive Caucus. For details about Dingell’s voting record on a wide range of issues, click here. In September 2015, Dingell joined more than 70 fellow House Democrats in signing a letter exhorting President Barack Obama to dramatically increase the number of refugees permitted to enter the United States from the war-torn, terrorism-ravaged nation of Syria. The letter claimed that Syrian resettlement in America had thus far been “insufficient in light of the current crisis” and “the dire circumstances” faced by the people of Syria. In February 2019, Dingell and fellow congresswoman Pramila Jayapal together introduced a “Medicare-for-All” bill designed to place the federal government in charge of virtually all of America’s health care system. Broader than a similar “Medicare-for-All” bill that Senator Bernie Sanders had introduced in 2017, the Dingell-Jayapal legislation aimed to expand Medicare so that it would also cover things like mental health, addiction treatment, dental care, and abortion services. the nationalization of banks and corporations is preferable to federal bailouts of those entities. Dingell’s husband died in February 2019. For more information on Debbie Dingell, click here. Further Reading: “Debbie Dingell” (Ballotpedia.org, Keywiki.org); “Dingell: ‘I Wanted to Cry’ Over [American Health Care Act]” (Daily Caller, 5-7-2017); “Republicans React to Push for Medicare-for-All by House Democrats…” (Daily Caller, 2-28-2019); Debbie Dingell’s Positions on Key Issues (OnTheIssues.org).